Despite your insane curiosity about the workings of the CURLING CONSOLE, you pass it by to grab one of the PING PONG PADDLES and a PING PONG BALL. You put them in an empty pocket--- wait. Oh, snap! All of your old INVENTORY, including your TIME DEVICE, were in your old TROUSERS! These LOANER SHORTS had nothing in them but six slightly unhygienic VARIOUS MONIES! You really need to get those pants back, or else you may break various TIME LOOPS and end the UNIVERSE in a BANG (as opposed to a WHIMPER). While you're over by the ANALOG VIDEO PONG TABLE, you also glance over to the PORTAL, which is glowing and pulsating with an immense energy which defies rational explanation as it expands endlessly into non-Euclidean geometries whose brief veil is torn asunder and threatens by its very existence to crack the fragile farce which is a Human mind into a thousand nightmare pieces. You've seen better. 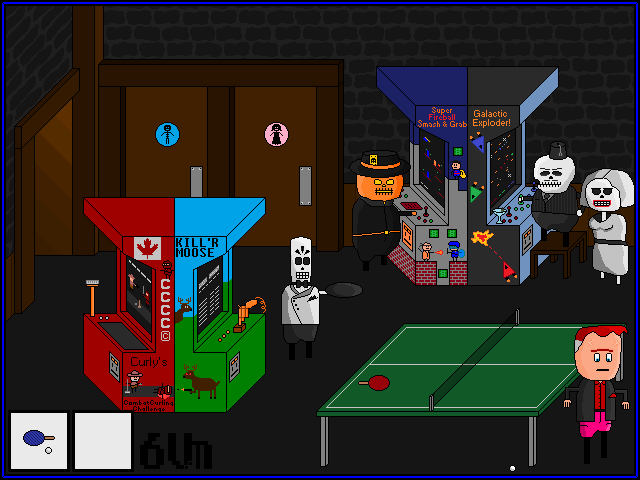 You are in an ARCADE ROOM. 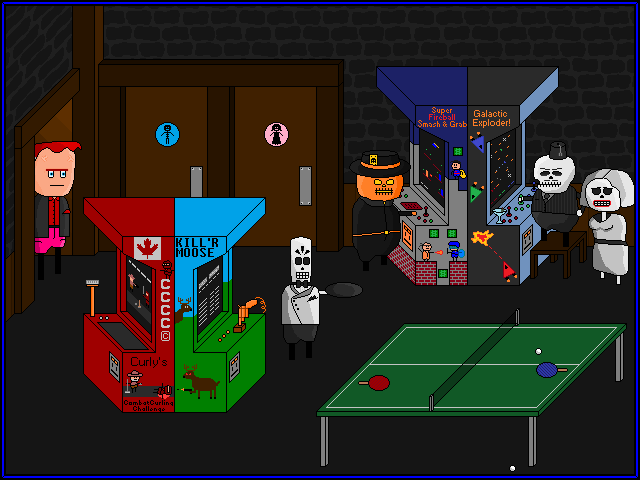 There are four ARCADE MACHINES: "Curly's Combat Curling Challenge," "KILL'R MOOSE," "Super Fireball Smash & Grab," and "Galactic Exploder!". There is also a PING PONG TABLE (sometimes known as a TABLE TENNIS TABLE and sometimes (less often) known as a ANALOG VIDEO PONG TABLE). MANNY has apparently delivered the DRINK he was carrying and is standing by. 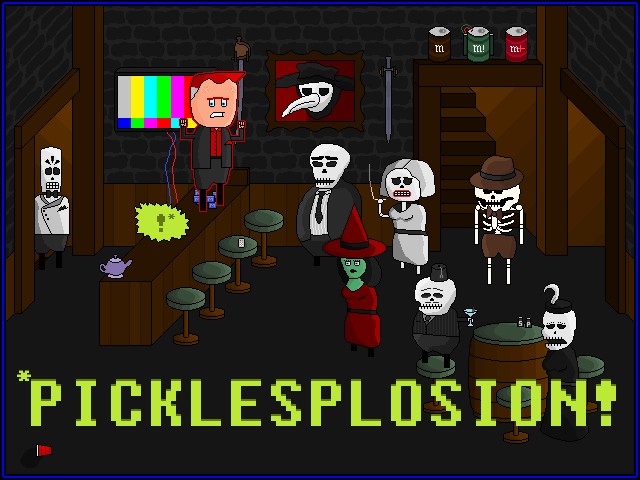 The short FEZ SKELETON is playing GALACTIC EXPLODER!, watched by the WHITE DRESS SKELETON. The SFS&G MACHINE is being played by some kind of... PUMPKIN-HEADED FELLOW (species previously un-encountered). Off-screen to the EAST is a large GLOWING PORTAL. Visible exits are WEST (back to the BAR), NORTH into the MEN'S ROOM, NORTH into the WOMEN'S ROOM (and you can't go in there! ), and EAST. You walk over to HENRY and ask for his SHORTS. He... declines. But, he pulls out a spare pair of SHORTS from the bar's LOST AND FOUND, which he maintains. They're not quite your style, but they're better than wandering around in just your BOXERS. You noticed a PRESIDENTIAL SEAL on the TELEVISION and ask the OVERWEIGHT SKELETON (how does that work?) to stay on channel two. Whatever the PRESIDENT has to say, it might be important. Oh my. He has quite a PRESIDENTIAL MUSCULATURE. 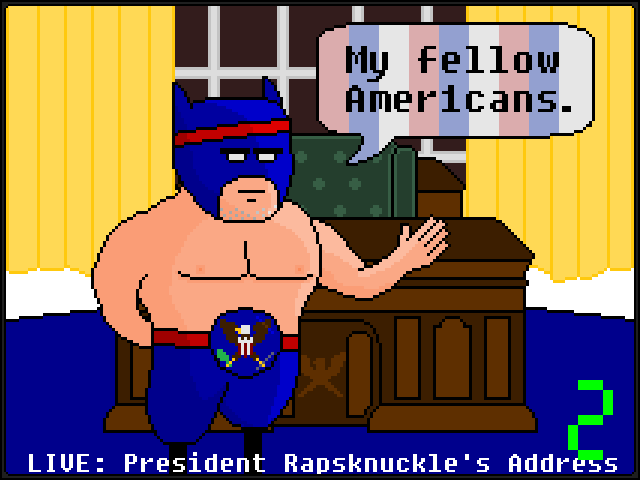 PRESIDENT PHILEMON RAPSKNUCKLE: Good evening, my fellow Americans. Both I and our nation are strong. The attack on my life earlier this evening has failed, and I come before you in this time of crisis to bring illumination to the darkness of our collective fears and work to explain the facts of our circumstances. We find ourselves in the unenviable position of a lion beset on all sides by jackals. Here at home, an attempt was made to kill my by a crack squad of ninja assassins bearing the mark of the Invisible Shogun's elite guard. While I managed to disrupt the attack with a combination of flying arm drops, presidental press bench slams, and snapbomb neckbreaker strikes, the audacity of the attack will live in infamy. Simultaneously, similar attacks are being carried against our allies in the North and South. To the North, Candaemons have struck the Royal Castle; the state of the monarchy is currently indeterminable. To the South, our ally the Pirate Lord, Silver Jim Pegbeard, has been confirmed killed in a similar strike. We are currently attempting to contact his successor and wish them our support in these trying times. This evening before the attack on myself, I received notification from the Eastern Ambassador from the Invisible Shogun. He told me in no uncertain terms that the Shogun has declared himself and his nation sovereign in direct rebellion to the spirit and fact of our Union States. I cannot accept this. The timing, the pattern, and the very history between us leads me to only one conclusion. Whatever assaults are taking place in the North, in the South, and here in the City, the Shogun is either behind them or in league with they that are. The facts will not cease to exist if we choose to ignore them. There is only one course of action which bears the mark of proper, proportional response to this intelligence. Today we make war upon the Invisible Shogun and his forces. Our world balances too near the edge of destruction, and we cannot allow cruel apocalyptic winter to once more fall upon us. We must act, decisively and in utmost earnest. Shogun: We will destroy you if need be. Our forces are prepared to drop you in a massive suplex the like of which the world has never seen. Assorted Daimyo of the East: Your master has committed an unforgivable folly. He has dishonored himself and your nation. Side with the Union States and together, we shall fly from the turnbuckle of justice and take this madness to the mat. The evil of the world is made possible by nothing but the sanction you give it. Take back your sanction and your honor. Citizens of our great and illustrious Union States, I will make something perfectly clear. The spread of evil, be it in the form of Candaemon, of betrayal by our allies, or in the form of the true darkness which aggrieves us, can only function because of a vacuum. Whenever evil wins, it does so only by default. It is by the moral failure of those who evade the fact that there can be no compromise on basic principles. Our nation is founded on basic principles of freedom and self-determination in mutual defense of our lives and our ideals. Today and in the coming weeks, as we work to help our allies around the world and work to keep our Union together and strong, we will defend our ideals with all the strength and resolve that our great nation can muster. Thank you. Good fight and good night. The PRESIDENT'S heavy metal EXIT MUSIC is cued and he departs the ROOM amidst crazy STOBING LIGHTS. ALAN: Hzzh mrphl crmb? Mrphl? What... what happened? You were up on the BAR... doing something... so... you must have done a face plant off of the bar. Did you suddenly turn into CAD on a BENDER when you weren't looking? This is like a Tuesday for him. No, that can't be it. You still have your BOXERS on--- and thank SCIENCE for that! You must have been out of it for a while. The room cleared significantly. 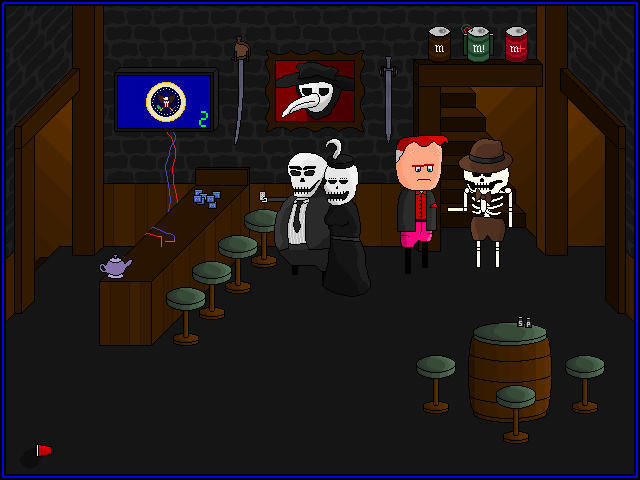 HENRY is still guarding the stairs and two of the other SKELETONS are flipping CHANNELS, but MANNY THE BARTENDER seems to be following a CROWD to the EAST. \ - / - I am Rhys! With that ASCII out of the way, I'll level with you guys. Trying to switch from the normal Blogger system to a third party system for posting and editing hasn't worked out. So I'm gonna get things together and come back strong on Wednesday night. It will involve a pickle. And it will be the best thing ever. So... I got the text part working. I was holding out for more, but, like Alan's pockets, no dice. Tonight's update will be text-only, probably losing a lot of the "gravitas" and "pathos" that is usually "evident" in my "artwork." (Sigh.) Hopefully everything will be back to normal soon. OK. She thinks you're cute. Nothing to do now but take a deep breath and try to figure out what's going on. ALAN: Thanks, Patience. Um, yes, I'm new here. PW: Nice to see a new face. Or, actually, any face that's more than skull. ALAN: Well, um, you seem knowledgeable. Will you show me around? Please? PW: No problem! Not much to tell, really. This is the pub's main room. Manny makes some mean mixers, and he has a whole jar of pickles back behind the bar. PW: The hall over there leads to the arcade, the bathrooms and the portal. The stairs there, behind Henry, they lead up to some kind of haunted house, but only the skeletons really go up there. They--- wait, how did you get in here, anyway? Us witches get a pass for the portal, but normal humans can't pass through without getting fried. PW: Oh, OK. So just here for a drink? ALAN: No. Um, actually, I need to get upstairs, I think. Into the haunted house. 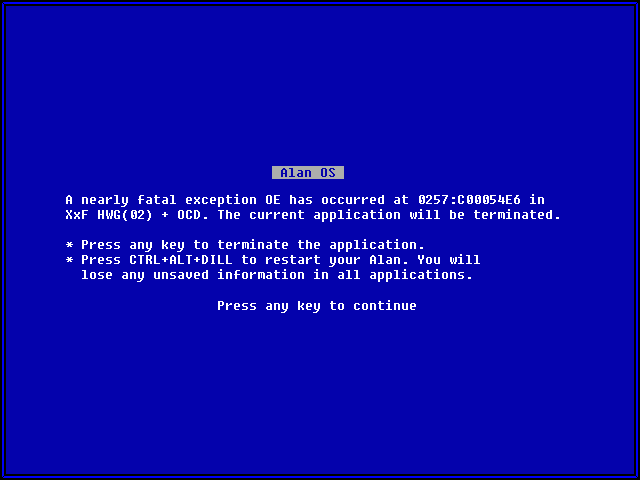 PW: That might be a problem. Henry doesn't let anyone but skeletons get up there, and he's got a mean bullwhip tucked away somewhere. PW: On the whole, you'll find most of the skeletons here to be pretty harmless. They mentioned something about someone killing somebody before I came in, but I haven't seen the body. The zombies are a bit more bitey, but the reformed ones usually keep themselves in check unless they see someone with a really madly smart brain. PW: Wait. Um... about your head...? ALAN: It's an a-typical non-syndromic macrocephaly. Largely cosmetic, non-threatening. Possibly a developed stereotypical reinforcement attribute reflective of perceived intellect as opposed to something strictly genetic or environmental. I don't think my head was always this big. PW: I didn't understand most of that. Still, you know what they say about guys with big heads. You blush uncontrollably. You do have trouble finding hats. You equip the CHEW TOY on your way up the STAIRS, wary of DEMON DOGS, HOUNDS OF THE BASKERVILLES, and SMALL YAPPY DOGS. When you reach the top, however, you find that this precaution is quite unnecessary. The STAIRS from the WINE CELLAR lead into some sort of UNDERWORLD BAR, possibly the "DEATH'S HEAD PUB". 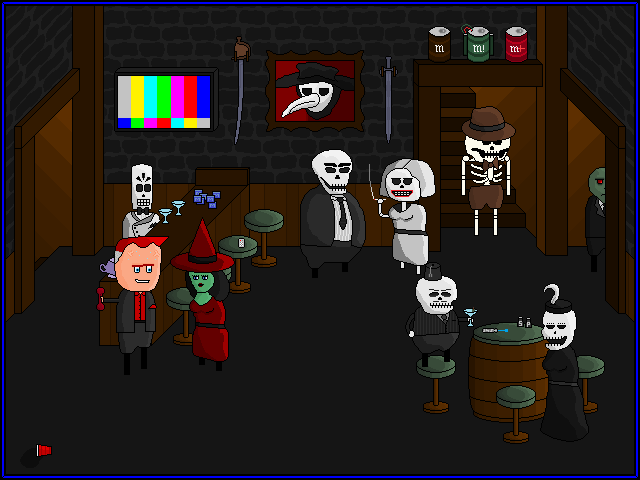 Several SKELETONS are standing around, along with a ZOMBIE and a WITCH in red. Some MATCHBOOKS like the one in your POCKET lie on a pile on the BAR, near some MARTINI GLASSES and a purple TEA POT. A REMOTE CONTROL sits on a BAR STOOL, probably the controller for the TELEVISION on the wall (which currently shows a test pattern). Also on the wall are two SWORDS and a picture of DEATH'S HEAD. Three MULE KICK CANS of various types sit above the DOORWAY to more STAIRS. On the BARREL-TABLE in the lower right sits a SONIC SCREWDRIVER, a SALT SHAKER and a PEPPER SHAKER. Exits are WEST (down the STAIRS you just used), NORTH (past the DAPPER SKELETON and up more STAIRS) and EAST (down another HALLWAY). You scoop up the CHEW TOY and dump it into a POCKET. This seems like a good time to investigate your INVENTORY. Your RHYS COSTUME is fairly accurate, and thus has the same number of pockets: six. That's a bit restrictive, but it's hardly an insurmountable obstacle. HAIR GEL and a half-empty VIAL OF RED HAIR DYE (for your disguise), VIAL OF ACID, two EMPTY VIALS. Looks like you're done here. You step over the DEAD SKELETAL RHYS and check the STAIRS for TRAPS. You wish you had some DICE with you so you could roll a SEARCH check. Finding nothing, you dutifully troop up the stairs--- Like a Rhys! What's waiting for you up there? It's not really a proper SHRINE if only one of the CANDLES is lit, so you pick up the MATCHBOOK and carefully light the rest of the CANDLES. You hear a faint "click" from somewhere above you. You check the MATCHBOOK and find that it's from the DEATH'S HEAD PUB, and comes complete with a picture of DEATH'S HEAD, which is obviously an appropriate MOTIF. You check your LEVELS of belief in supernatural phenomena. Ah, they're much higher than most people might anticipate. After all, once you've seen one army of MAGICALLY ANIMATED CORPSES, you've seen them all. After such proof, belief is de rigueur (mortis). Ah ha. Ah ha ha ha. Ha. Oh, that was a good one, Alan. Quite good. Ha. Finally! Everything is back to normal so that general exploration and shenanigans can continue. With any luck, no one will even notice you're not actually RHYS O'CALLAHAN. Your DISGUISE is perfect, after all. What shall we do... Rhys...? FEDORA ALAN appears at an UNDISCLOSED LOCATION somewhere in TIME and SPACE. He puts STASIS RHYS against the GARISH WALL and checks in with some of his CHRONOLOGICAL TWINS. FA (FEDORA ALAN): Subject acquired. NA (NORMAL? ALAN): You--- we--- I didn't hurt him did you? NA: And why is this necessary again? SA (SKI-MASK ALAN): Get on with it! RA (RHYS-LIKE ALAN): Mr. Freeman? NA: I think we're getting off track. FA: NEVER SAY THAT AGAIN! FA: I'm delaying too long. Dispatch temporary replacement Rhys. Rhys-Prime must be examined. 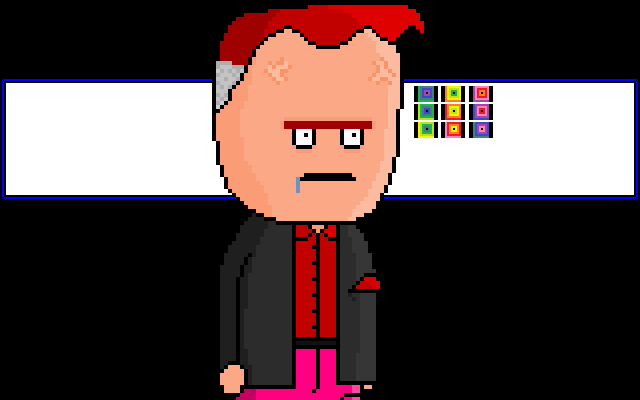 RHYS-LIKE ALAN presses a button and whirs off through TIME.